Obituary: SAMUEL S. VARNADO, JR., “Sam the Picture Man,” 92, passed from this life Tuesday September 25, 2012 at the Sam Rayburn Memorial Veterans Center in Bonham. Funeral services will be conducted at 4:00 p.m. Saturday September 29, 2012 in the chapel of Starrett Funeral Home with Rev. Buddy Barnett officiating. Burial Rites will be offered by members of the International Order of the Oddfellows, Wildey Lodge No. 21. A private family interment will follow in the Oddfellows Cemetery in Paris. The family will receive friends at the funeral home for one hour prior to the service. Interment will follow in the Oddfellows Cemetery in Paris. 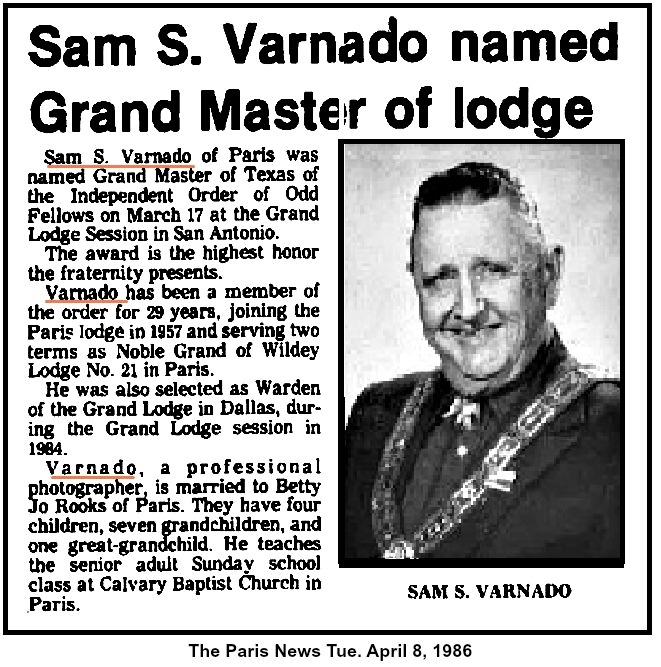 Sam was born June 17, 1920 in Bolivar, Louisiana, a son of Samuel S. Varnado, Sr. and Ruth Langford Varnado. He attended public schools in Independence, Louisiana, and attended Southeastern Louisiana College. He served in the U.S. Army during World War II. 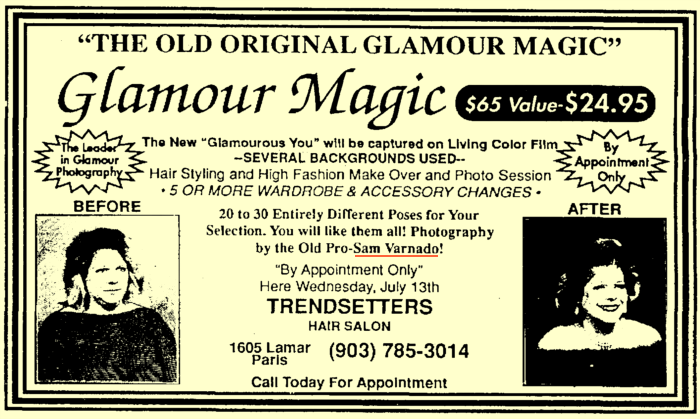 For over sixty years he worked as a professional photographer, operating studios throughout Texas. 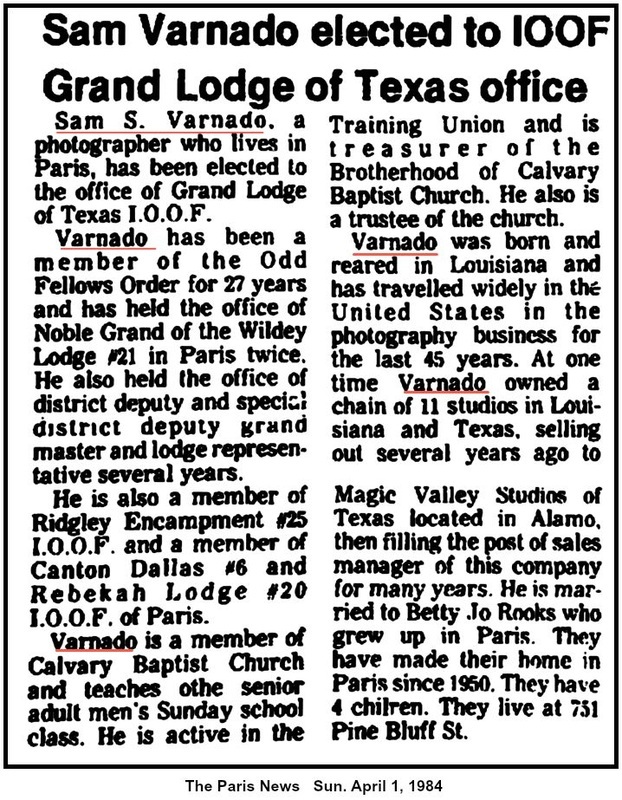 For over fifty years he was a member of the International Order of the Oddfellows, serving as Texas Grand Master in 1986. He was a member of Southside Baptist Church, where he taught Sunday School for over thirty years. 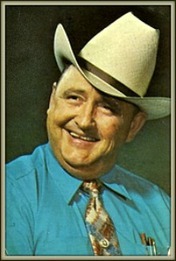 Sam married Betty Jo Rooks in 1949, and she preceded him in death in 2005. In addition to his wife, he was preceded in death by a son, Gerald Artie Varnado; and by two brothers and one sister. Survivors include two sons, Jeffrey Varnado and Douglas Lowe and wife Mary Lee, both of Paris; and a daughter, Ruth Ann Dagerath, of Texas City; seven grandchildren; fifteen great-grandchildren; five great-great-grandchildren; and numerous nieces and nephews.